So that's it… It's been just over a week since I've landed back from Sin City and I'm finally starting to remember which way is up!! This last post is more on the night life in Vegas…I know now that I can't do it justice - The place is just an insane buzz of bars, casinos and the completely crazy high life!! Evening dress code for me is heels and for this reason (and #5), cabs are a must at night (until you've had a few drinks and can't feel your feet anyway..)! It is actually illegal to flag a cab in the street in Vegas - you can only pick them up from the front of hotels, for which there is no shortage - just watch out for lengthy queues at peak times!! On one night we went out to Palms hotel… Like everything in Vegas, it looked fairly close but, actually not… It's not on 'The Strip' either but, worth the 5 minute drive out. 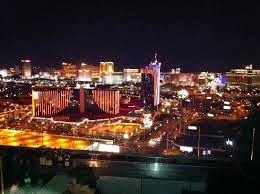 We went to The Ghost Bar at Palms - 55 floors up with breathtaking views across Vegas!! The bar/club is intimate with an open air area that's amazing to watch the sunset over the city whilst the DJ knocked out chilled out vibes. Once fuelled with incredible mojitos, we descended a few floors down for dinner at Nove, a stunning Italian restaurant within Palms. 55 floors to the ground right there - my image and my feet! Guess who I bumped into in The Ghost Bar…?! Elvis Selfie - CHECK! I'm not big into gambling….Like, why 'waste' shopping money?! That said, it was Vegas so having a dabble was unavoidable! I tended to stick to Roulette machines.. Less pressure, lower minimum bets, a guaranteed seat and regular bar service…. It also appeared the more I played, the better I got - I can see how it could get dangerous! It's so easy to sit, gamble and get slowly hammered… 3 hours on, after barely moving, I stood up and was reasonably unsteady in the Valentinos! On the point of drinking in the casinos… It's table service and it could be a bit slow sometimes, I found that tipping your server on the first round encouraged them to keep coming back…Of course, don't let that be the only tip…it's kinda' frowned upon out there. This one's a bit Ying Yang - Primark skirt and Valentino's! Skirt - Primark, picked up in the Christmas sale for a fiver!! Crop top - River Island, buy here. Valentino Rockstuds - My loves… Bag - J.Crew, purchased in Vegas (more on this in a moment..) Rings - A selection from Zara and & Other Stories. When in Vegas there's gambling and SHOWS!! The choice of shows is incredible, all of them boasting world class performances. We chose to book before we flew out - KA, the Cirque du Soleil show at MGM Grand. I paid full whack for the tickets and got some amazing seats - it turns out you can pretty much buy them out there for half the price though!! There are several 'Half Price Tix' outlets on The Strip… You kinda' take your chances and high profile shows like Britney probably won't be available…It's worth shopping around! Jeans - Primark petite, still in store. Peplum top - Zara - seriously comfortable/forgiving! I can't find it online but it's new - similar here. Clutch - Primark, last year…£4? Heels - Zara corset shoes from last summer. High Roller - The biggest ferris wheel in the WOOOORLLLD - It takes up to 40 minutes to go all the way around in the great big pods that give you incredible panoramic views across Vegas. The best bit it, you can take your own drinks (as in alcohol) on to it too - Stock up at Walgreens and have a cheap night! Freemont Street - This is outside of the strip, best to grab a cab! It's worth it though, smaller and most definitely cheaper bars and restaurants! If you are taking a cab there, ask to go on the '15' - A cabbie told us this as it stops the driver taking you the long way around…TUT! Others worth a mention; Diablo, Señor Frogs (both south on The Strip) and then Hyde and Bank at the Bellagio. Our last night there was 'Cocktail Dress' or, in my world, the perfect excuse to knock out that & Other Stories black lace dress again as featured here. Vegas Advice #14 - Last but not least - Outlet Shops!! There's a few 'outlet malls' in the Vegas area - I acted on advice given to me and went to Las Vegas Premium Outlet - NORTH!! Shopping time was minimal for me - Go early, before the rest of Vegas wakes up… The shops open around 9.30am, you can get a bus from The Strip or a $20 cab. You can also buy a coupon book (money off stores) - I didn't because I didn't find out about it until I was leaving but still, you can get even bigger discounts off RRP with this. I hope you've enjoyed my take on Vegas!! Normal service will be resumed with a new POTW - COMING SOON! And...wait...that skirt is Primarche?? Sick! And...wait (Part 2)...hot couple alert!!!! If I ever go to Vegas I will be using your guide book...end of!!! That's a huge compliment, thank you! !